The “product 172” was designed in Nishni Tagil as the variant of T-64 with less advanced but more reliable engine. It was close to the T-64 only in its first iteration. Before the series production started almost all the construction, including running gear was replaced and the T-72 shared with T-64 only the gun, communication equipment and some components of FCS. The smooth-bore 125mm D-81T gun was the world’s most powerful tank weapon in mid seventies and retained its advantages for quite a long time. Unfortunately the range of shells offered for D-81T by Soviets was limited and became obsolete very soon. The auto loader device purpose-built for T-72 and different to those used in T-64 and T-80 enabled the tank to fire up to 8 shells per minute. Another advantage of T-72 is its low silhouette. The price for it is the cramped inner space assuring only minimum comfort for the crew. That feature made any upgrade of the T-72 difficult too. 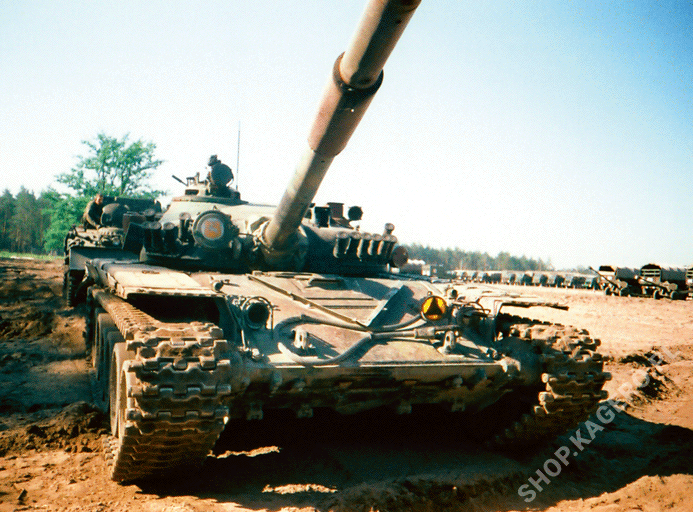 Series production of T-72 started in 1974. It was released for export in 1975. The basic version with co-incidental range finder TPD-2-49 was replaced in 1979 by the T-72A with TPD-K1 laser range finder and thicker multi layered armour of the front part of the turret. Early T-72As retained rectangular, separated and folded side protection screens while the later had conventional side skirts made of reinforced rubber. Another improvements were introduced in 1980: an enhanced V-46-6 engine, more accurate 2A46 gun and Tucha smoke grenade launchers. 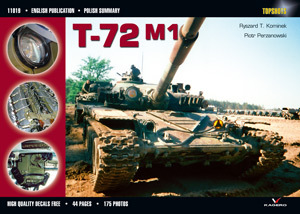 The export variant of T-72A was called T-72M and was available since 1980 with simplified multi layer glacis plate and without of ceramic “filling” in the cast turret armour while T-72M1 (introduced two years later) had the protection level equal to T-72A. T-72M/M1 replaced the oldest export variant of T-72 on the foreign production lines very fast (India just started production with “M” in 1987). It became a base for numerous local upgrades like Yugoslav M-84, Polish PT-91, Slovak T-72M2 etc. Even the latest Chinese MBT called “Type 98” has the hull and running gear very similar to those developed for T-72 thirty years earlier. Despite of its age T-72s in its newest incarnations belongs to the elite pool of world’s most powerful MBTs. It is one of world’s most popular modern tanks – only in Soviet Union about 30 000 were built while the number of licence produced MBTs of that type is close to 4500.